An in-depth review on Nature’s Way Forskohlii Standardized is presented in this article. The goal of this supplement is to promote fat loss, help build lean body mass and aid effective weight loss. This product is manufactured in accordance with the federal Food and Drug Administration’s (FDA’s) Dietary Supplement Good Manufacturing Practices (GMPs). Continue reading the entire review to know more. The major ingredient of this product is ForsLean, a patented forskohlii root extract standardized to 20% forskolin (25 mg) and coleus forskohlii root extract standardized to 1% (1.25 mg) forskolin. This product does not contain artificial coloring, dairy products, gluten, preservatives, salt, soy, sugar, wheat and yeast. The manufacturer recommends taking one capsule two times in a day. To achieve maximum results, the supplement must be taken before meals or as directed by your healthcare professional. One bottle containing 60 veggie capsules costs $18.52 in amazon and this is definitely cheaper than the list price of $30.99. To add, this also includes free shipping and a savings of 40%. You can also buy this product from My Leafine, the retailer’s resource for ordering Nature’s Way Forskohlii Standardized. You can expect this product to help you lose weight and build lean body mass, only if you combine it with a sensible diet and an effective exercise program. This supplement should not be used by people who have gastric ulcers or low blood pressure. If you are pregnant, nursing or taking any medications, you must consult a healthcare professional before use. Since the interactions of this supplement with prescription medications are not established, it is safe to check with a medical professional before use to avoid adverse effects. This supplement is not meant for children less than the age of 18, hence it should be kept away from the reach of children. There is no money back guarantee advertised in the manufacturer’s website or amazon for this product at the time of writing this review. However to return an item, you have to contact the customer service team and obtain a return authorization number. This number should be included outside the box containing the items you plan to return to Schwabe North America, the parent organization of the manufacturer. There are some guidelines included in the returns policy. The manufacturer will not accept returns for sealed, unopened products. The returns must be made within 60 days of invoice date and must be accompanied by a copy of the invoice. 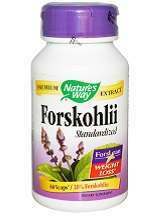 Nature’s Way Forskohlii Standardized is based on clinically proven ingredients and formulation. This product had good reviews online. The pricing was also affordable and significantly cheaper than most of the competitor products. However lack of money back guarantee can be a concern for first time buyers and risk averse users.